Some towns have picturesque historic centres, others have a scenic river front. Some have a stunning mountain backdrop, others beautiful beaches. Others have a great nightlife or a charming literary festival. 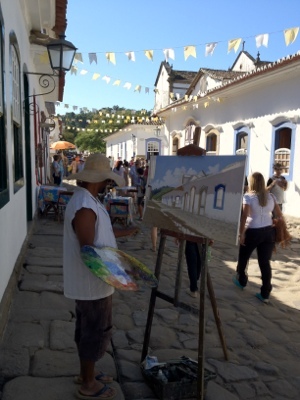 Paraty has it all. 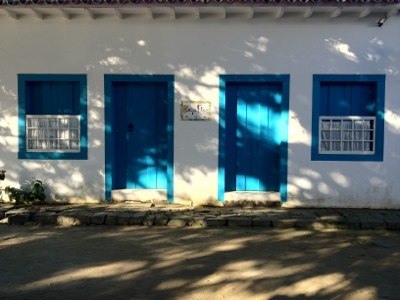 It’s probably no bad thing that Paraty is so perfect, after a boat, two taxis and 3 busses, it’s not been the easiest to get to (albeit most places aren’t when your starting point is a remote island). To arrive at the town after 24 hours if traveling and find us so picture perfect with South America’s biggest literary festival on is both a blessing and a curse. The town is packed with artists, street performers and the bars full of revellers. On the downside… The town (and corresponding hostels) are packed! After sometime searching online, we stumble in to a hostel that can take us for only one night – about 4 less than we were hoping for – bit it’s clean, that landlady is friendly and doesn’t seem interested in fleecing us. Tomorrow night we can take care of later. Exploring the “cobbled” – read boulders strewn – streets simply reveal more and more delightful scenes – every picture looking like a shot from Conde Nast Traveller. 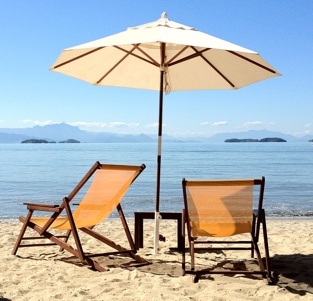 E take a seat in a bar and take our first sip of a genuine Brazilian Caipirinha and listen to an acoustic rendition of The Girl From Ipanema, a privilege we later realise we must pay for, we plan our stay. Moving on to the beach we are once again confronted with natures simple perfection – the beer helps too. The next day we explore the festival, a must for those scholars of Portuguese or Brazilian literature, some if which is even translated into English. More climbing over the cobbled streets and then to the bus station. Back to the lives of commuters as our next hostel is 25k out of town – damn these tourists clogging up these picture postcard towns!